With Chief Judge Rader stepping down as Chief Judge later this month, it would appear that the line of succession for Chief Judge will be 1) Judge Prost; 2) Judge Moore; and 3) Judge Chen. This assumes that Judge Prost serves until her 70th birthday and that Judge Moore serves as Chief Judge for a full seven year term. Incidentally, it appears from Judge Prost’s Wikipedia entry that she had a birthday this past Saturday. So, she will turn 70 a week shy of a full seven year term. Chief Judges may serve a seven year term or until they reach the age of 70. The IPBiz.blogspot.com site noted that David Kappos has an article in today’s Detroit Free Press. I thought Mr. Kappos’ article might interest readers; so, here is the link: [Link]. 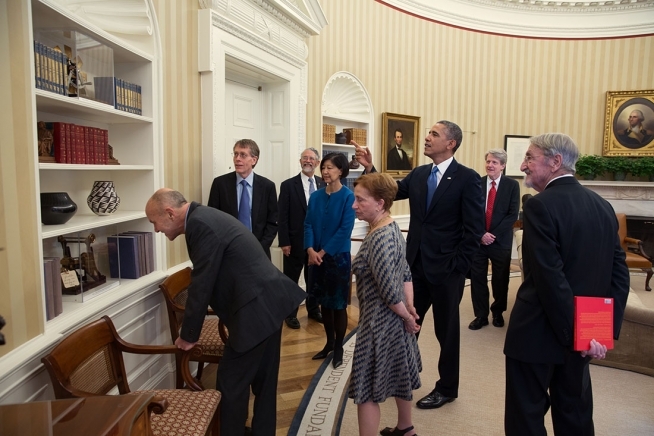 President Barack Obama points out several patent models while meeting with the 2013 American Nobel Laureates and their spouses in the Oval Office, Nov. 19, 2013. Hard to believe that the Whitehouse.gov site celebrated this photo as the “Photo of the Day” back on November 19, 2013. 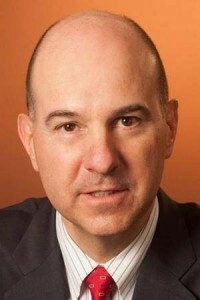 That date was roughly a year after David Kappos announced he would be stepping down from being the Director of the USPTO and no nominee to replace him had been tendered by the Obama administration. Fast forward to today and still no nominee. Perhaps the USPTO should request that the Whitehouse return those patent models. You are currently browsing the 717 Madison Place blog archives for May, 2014.